Another Twitter take over by Daniel which took place today. This time via Lionsgate UK's Twitter account in promotion of Horns at Twitter UK. You could send in questions with the hashtag #AskRadcliffe. If you missed the Q&A, I have collected the questions and answers below. Dan says: Hi @PhoenixHogwarts Yes, definitely. In fact i've written a script which is a very dark comedy. Hopefully i'll get to make it one day. What is the weirdest thing that happened to you making the film #Horns ? #AskRadcliffe @LionsgateUK Greetings from #Venezuela! @LionsgateUK #AskRadcliffe What was the most challenging part about playing Ig Perrish? Dan says: Hi @PerryOBree Trying to be as real as possible while dealing with the insane situation. Dan says: Hi @ThatsSoRenate The master & margarita, and I would also recomend Slaughter-House Five. Dan says: Hi @ginnyweasleys Probably as Ig from Horns as I still have the jacket. @LionsgateUK #AskRadcliffe my son learned to smile watching you on the Autism DVD you contributed to at age 12. What are you most proud of? Dan says: Hi @QueenNilya That, now... and thank you! Dan says: Hi @Radcliffe23 my parents. @LionsgateUK #AskRadcliffe which characteristics you share with this new character ?? And could you be friend of him??? Dan says: Hi @krla16 I could definitely be his friend, he has great taste in music and if he wasn't dealing with the Horns would be a really nice guy. Dan says: Hi @chosen_auror Her fearlessness, her work ethic and generally being a lovely person. She's the best! @LionsgateUK #AskRadcliffe if you had a chance to play any other character on horns, who would it be? @LionsgateUK #AskRadcliffe what was the most difficult part of the filming for Horns? @TwitterUK #AskRadcliffe in #HornsMovie you get people to reveal their darkest secrets. Who would you like to do that to in real life? #AskRadcliffe What are you looking for when you read a script? Dan says: Hi @pisces_regina I love it, she would hang on to me to stay warm. She got that name as she was carried in a Star Wars pillow case. 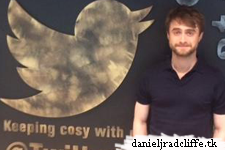 That's it from Daniel Radcliffe for #AskRadcliffe, thanks for all of your Q's! Don't miss #HornsMovie in cinemas October 29th.